Safety and security is a key issue for every business, here at Krosstech we can provide the ultimate solution for restricting access with our range of safety bollards. Manufactured in Australia, our range of safety bollards comply with Australian Work Health & Safety standards. They are designed for traffic control, property protection and to absorb impact. Bollards are principally used to separate vehicles from pedestrians, still allowing bicycle access. They are used to protect high-cost structures or objects from damage by moving vehicles. Bollards vary in height and diameter depending on the degree of security required. They are a specialty product that usually target a specific risk or threat. If you think your workplace requires safety bollards, browse our range of quality options. Safety bollards allow separate traffic flow of vehicles and pedestrians, ensuring and promoting safety. Our range of safety bollards are ideal solutions for warehouses, airports, shopping centres, businesses, hospitals, schools, homes and more. 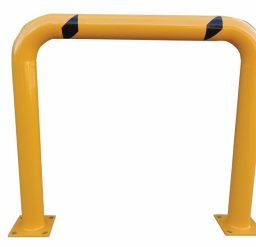 Every safety bollard and piece of materials handling or storage equipment we supply, is designed and manufactured in line with the strict industry standards and comes with the guarantee of our high standards. We’re a reputable provider that makes your security a priority. We’ve been supplying our quality products to Australian businesses for over five decades, and understand the demands of different industries. Our professional team at Krosstech applies their extensive knowledge and expertise to supplying quality equipment that caters to the unique requirements of your industry. Operating since 1968, we’re confident in giving advice on the best product to assist with your needs. Minimise workplace injuries by installing Krosstech’s Safety Bollards. 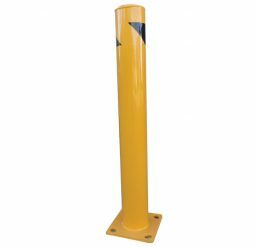 Our range of safety bollards are finished with a safety yellow powdercoat in a durable paint to ensure years of use. Invest in safety in your workplace today and browse our range of safety bollards.